Vše o suchých pleťových maskách nfibrecare - jste připraveni na revoluci? of the finest fibers in the world. 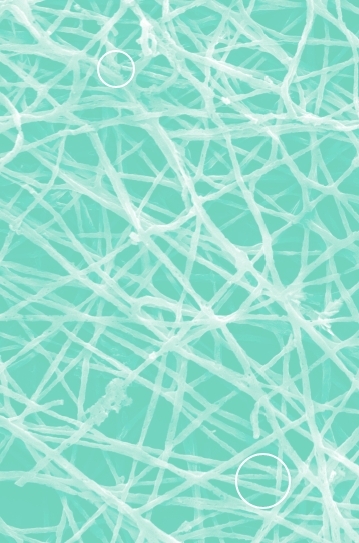 These invisible fibers handle active ingredients in a different way than other masks. With nanofibers, the actives are incorporated within their tiny structure and carried and protected until the mask touches your skin. First then they are released from the enormous surface area of the fibers and delivered homogeneously and safely to your skin. Just one of the many perks of nanotechnology. Common sheet masks contain almost 90% of water and glycerine along with additives such as fragrances, acrylates, sillicones and other additives that might irritate your skin. In the ]n]fibrecare mask, you will find none of them. We swear by less is more - meaning less ingredients and more effect for your skin. Done in just 8 minutes! We understand that your skincare ritual isn`t just about our mask. Therefore, we made sure that it worked quickly. Thanks to our illustrated tutorial card, you will get a smooth experience at the first try. (micellar water, toner, cream or a serum). Carefully remove the white silky cover layer. Apply with the blue side facing outwards. The ultimate anti-aging and anti-pollution mask. The powerful mix of 7 vitamins boasts both preventative and corrective effects. Well-suited for all skin types and age groups." Our secret weapon for tired and dull looking skin. Two powerful antioxidants and two moisturizing agents will make sure that your skin is in perfect shape in no time. Our soothing and conditioning mask is the perfect option for irritated skin. Have you been using too much product on your skin? In need of a post-treatment solutin? The minimalistic gentle formulation will provide instant comfort and relief. Probably the first sheet mask without active ingredients. Use this professional mask to enhance penetration of your favourite skincare products! This mask is loved by estheticians as it helps the products to stay in their place and protects the skin from outside contamination during the ritual.